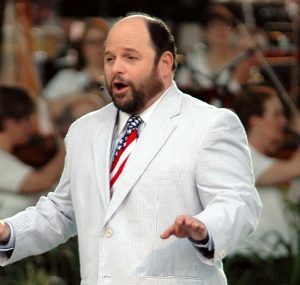 Former “Seinfeld” star Jason Alexander has taken a gig with KFC to be the company’s newest Colonel Harland Sanders. Alexander is the latest in a long line of actors and entertainers to don the iconic white suit. Darrel Hammond, Reba McEntire, Ray Liotta, Rob Lowe, Jim Gaffigan, Rob Riggle, and George Hamilton have all played the chicken tycoon over the years. KFC started the tradition in 2015. Alexander will be tasked with hawking the chain’s latest chicken offerings, including its $20 Fill Ups buckets aimed at large groups. KFC has already debuted two of its newest commercial campaigns starring the actor. Based on the released video, Alexander’s Colonel Sanders plans to show how the chain’s chicken-based meals can solve a variety of household problems. Andrea Zahumensky, the chief marketing officer of KFC US, said in a press release that there was “no better person” to portray this iteration of the Colonel. In the press release, Alexander said, “It’s been fun to combine my personal love for KFC with my sitcom experience into a new take on the role of Colonel Sanders.” The campaign has already begun airing nationwide.